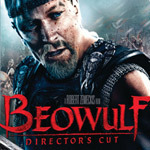 The Director’s Cut of Beowulf offers only a few brief moments of extra gore, but it’s still a mighty fine piece of storytelling, one that warns about the temptations and dangers of the more base human desires. Overall, the disc offers a decent package of supplemental features. But, given all the work involved in this production and the clever retooling of the source material, a running commentary with Zemeckis, Gaiman and Avary could have been really enlightening. Unfortunately, no commentary track of any variety is on tap. Well said. And the 23-minute making-of documentary is also pretty well done. There’s loads of footage of Winstone and Glover in skin-tight black outfits, acting out the roles that will be far more lavishly presented in the end product. But, for all the time spent showing the actors in their funny tights, this short documentary merely glosses over the entire alphabet that exists between getting the movie from point A to point B and still leaves plenty of questions unanswered about what happened after the actors fulfilled their duties. The disc also carries a slew of short featurettes. Beasts of Burden — Designing the Creatures of Beowulf is a really good look at the thought process behind the film’s monsters. Creating the Ultimate Beowulf is merely a quickie 2-minute look at transforming the kinda chubby Winstone into the hunky Beowulf. As with the main making-of documentary, this featurette doesn’t really address all the computing required to turn the one into the other. There are also six deleted scenes, but they’re all in the very early, rough stages of production and, therefore, rather hard to watch with much enjoyment. The first one, in which Wealthow shows Beowulf the sundial, is pretty neat in terms of the ideas involved, but the others are so-so at best. The disc also sports the original theatrical trailer. One last note: there is an Easter egg! It’s entitled A Coffee Break with John Malkovich and it is exactly what the title implies. It’s pretty goofy, but why not? To access it, go to the first page of Special Features then left arrow from the top option to reveal the hidden option. This is a beautifully done disc. The video presentation is marvelously first rate and it’s backed up with a terrific, richly-detailed soundtrack in Dolby Digital 5.1 (available in English, French, and Spanish). The disc also includes English, French, and Spanish subtitles. Check out the movie in all its unrated gory… er, glory. Then plunder the additional features by checking out A Hero’s Journey and Beasts of Burden. For those hungry for a little more pillaging, maraud The Origins of Beowulf, but proceed with caution if you raid the other supplements.